On 18th November, I Twittered that I hadn’t seen Mustrum that morning. And we didn’t see him again for ten days, by which time we were both sure he was gone for good. He is microchipped, but a lot of places don’t automatically scan for them, I know. He was a real roamer in his day, but Mussum is 13 years old now, and likes to be at home in the warmz, with his blobs to make a fuss of him, and it’s really not like him to be away for any length of time any more. We put notices up on local web sites, and went calling him – not helped by the fact I was ill and had lost my voice. We resigned ourselves to never seeing him again, and I felt positively cheated that I didn’t get a chance to say goodbye. On the 28th, at about 10.30 in the evening, Pete was talking to me; out of the corner of my eye I thought I saw Mussum in the living room by the sofa. I looked away, and looked back and HE WAS. He was home! I just croaked at Pete, right across what he was trying to tell me – we were overjoyed. Muss was thin – about 20% of his body weight, I would guess. We live in a grid of Victorian terraced streets, and he’s never been far; our feeling is that he got spooked by a car or a dog, and just ran for it, and then got completely lost. 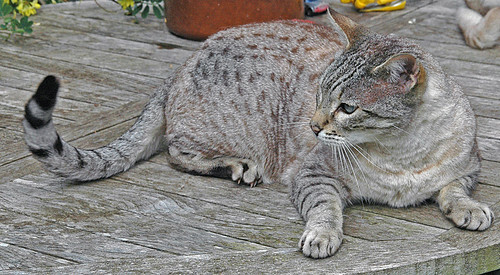 We opened two tins of fatted calf meat (well, tuna Hilife) – one for him, and one for the rest of the Tribe. He got his bowl up on the worktop, and shouted while he ate it. I think he was as pleased as we were to be home. The others, remarkably, stood back and let him finish their bowl too, so perhaps they missed the old chap as well. Anyway, he’s home. Don’t do it again please, Mustrum – my nerves couldn’t take it. Very happy news! Heart-warming, no less. I do so love a story with a happy ending! I am glad that Mustrum is back where he belongs and by all the signs, so is he. The story reminds me of when my Artemis went missing. It was only 3 days, not 10, but we were distraught. She returned, cheerful and no worse for wear, but unable to tell us of her adventures. I am guessing, but I suspect that she got shut in a garage or shed that she was exploring and had to stay there until the next time the door was opened. I would make a similar guess for Mustrum. That would explain the loss of weight, too.